New mothers throughout the ages have had enough to deal with, and Ron and Lisa have well covered many of the pitfalls mothers face in today’s toxic, chemical-laden age. There is, however, one more major problem that is under-reported in this country, yet is growing in the name of improved technology; namely, the rapidly increasing sources of radio frequency exposure specifically affecting pregnant women, new mothers, infants and toddlers. From cell phones and tablets to e-readers and baby monitors, children and their parents today are bathed in a soup of radio frequencies never before experienced. Researchers outside the US are already sounding the alarm. The American Academy of Pediatrics and the American Academy of Environmental Medicine have called for greater awareness of the harm to children and mothers from RF exposure. The AAEM has also called for a moratorium on the deployment of smart meters. Recent studies show that if a woman uses a cell phone while pregnant, her child will have an increased risk of emotional problems as a teenager. Men are experiencing a decrease in fertility from using cell phones while in their pocket. Women now have breast cancer linked to wearing cell phones in their bra. How many mothers today put a tablet or laptop in front of their children to play a movie? Often this is streamed wirelessly, but even if played from the hard drive, tablets and laptops still emit a strong pulse of radio frequency every few seconds as they search for a Wi-Fi router; regardless of whether an Ethernet cable is plugged into the laptop. Think of it like smoke coming from an ashtray with lit, burning cigarettes – except in this case, you cannot see or smell the smoke. Likewise, if a mother uses her smart phone while holding her baby, besides the strong frequencies that the phone emits when a call is in progress or emails or texts are sent or received, the phone also emits a homing signal every few seconds (even on standby) to let the nearest cell tower know it is on and ready to receive a call. This happens 24/7 while the phone is on. Therefore, don’t sleep with your cell phone near your bed as an alarm clock (unless you put it in Airplane mode). Mothers need to put their tablets, e-readers and smart phones on Airplane mode which will disable any Wi-Fi pulses, while simultaneously disabling the 3-G or 4-G homing signal to the cell tower. You will be unable to visit the Internet or send and receive messages, emails or calls while in Airplane mode. If you are playing a movie, reading, or listening to music from the hard drive, however, then you will be safe. Countries ranging from Russia to Israel and the entire European Union are now calling for a ban on Wi-Fi in schools. France has removed Wi-Fi from its libraries. What exactly do these countries know that we don’t? That research shows cellular bio-disruption occurring gradually over time at exposure far below levels considered safe by the FCC and industry (which only looks at tissue heating). Governments in these countries pay for the health care for their citizens. They see a looming health crisis and are being proactive. Visit my website under “Cell Phone and Radio Frequency Risks” for additional details. Lastly, exist baby monitors. In an effort to increase range, manufacturers make them ever more powerful. Yet, the strength of the RF signal now far exceeds what many European researchers consider to be safe. Older 900 MHz analog monitors are selling like hotcakes on E-bay, although they are not without risk. Ultimately, it is best to set up a hardwired closed circuit audio/video system or just leave the doors open to your baby’s and your bedrooms and have no monitor at all. Read up on this topic. Learn what other countries are doing. Be informed and follow our admonition to reduce use and increase distance. Use hardwired alternatives for telephones and Internet wherever possible and disable Wi-Fi and Bluetooth on routers and computers. In just a few years, this information will be widely known and accepted in our country, hence you will be glad you took a proactive approach today. This is why we limit the amount of time our children spend around electronics. So many of their young friends have cell phones, ipod touches, tablets, hand held games; the list goes on and one. I recently bought them homemade toys at a local craft show and THAT is what all the neighborhood kids have been outside playing with this week. Shopping from local handmade retailers can eliminate a lot of issues. Thanks for the article! Thanks for your feedback Suzanne! That is fantastic you limit your children’s time around electronics. You are being a great role model for other parents in your neighborhood. Plus, supporting local retailers is such a wonderful thing for our economy…not to mention the safety issue of avoiding imported goods than can contain toxic heavy metals, etc. Another point I would like to add. The video games that kids play on in front of the TV now have cordless hand-held joy sticks, and they emit very high radio frequency levels right in front of the kids who are using them. Likewise, the electronic boxes sitting under the TV that the hand-held joy sticks send their signals to also fill the room with high levels of RF even when there is no game in progress, similar to cordless telephone base units sending out RF signals while on standby. Homes are being filled with a toxic soup of continuous wireless signals and prudent avoidance is always recommended. I love that you were covering this important topic. Now if you could just get on the Dr. Oz show and tell everyone…. I have found that people are extremely resistant to this information. I’m not exactly sure why. By speaking out on a more public level you could change the future for all of us. Thank you for your feedback! We do speak quite frequently on this topic in almost every presentation we give to a live audience, in our book, Just GREEN It! Simple Swaps to Save the Planet & Your Health, on this blog and even in our videos found at http://www.YouTube.com/HealthyHomeDreamTeam We agree, it is such an important topic and we hope more people wake up to the importance of awareness on this issue! 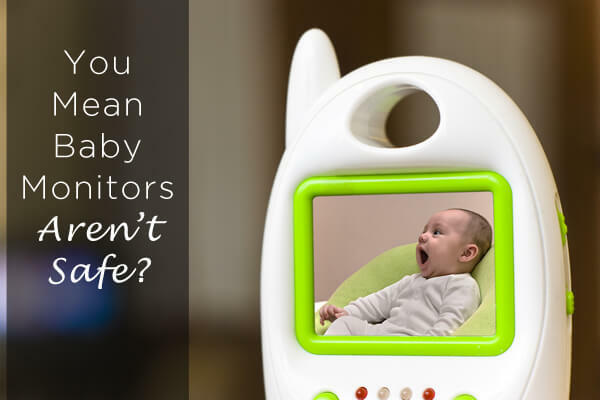 Electronic devices is harmful devices for baby and its not safe for baby,so i don’t think so baby monitor safe.